At the tail-end of 2018, Microsoft announced that it would remove the Clutter feature from Outlook, leaving Focused Inbox to sieve out your less-important mail. We think that’s a potentially worrying change of direction for Microsoft. Yes, on the one hand, you could argue that Focused Inbox competes directly with similar features offered by Gmail and that those only work in the Gmail client, so why not do it. 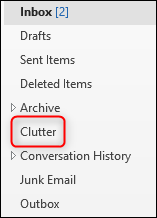 But, you could also argue that, since Outlook has had both the Focused Inbox and Clutter features for a while (and they both have their advantages), there was no really good reason to ditch Clutter. So, let’s get into it. We’ve covered the difference between Clutter and Focused Inbox before, but here’s a quick recap. Both Clutter and Focused Inbox are ways of splitting your incoming mail into “important” and “unimportant” mail. Important mail is anything from people in your company, your contacts, and anything else Microsoft’s algorithm deems valuable to you. Unimportant mail is not spam (that goes into the Junk folder) but is mail that is deemed less valuable or urgent—like regular emails from apps or websites. Clutter and Focused Inbox use the same algorithm to determine if a mail is important or unimportant, but here’s the important part: Clutter is an entirely separate folder, whereas Focused Inbox is just a filtered view of your Inbox. Focused Inbox—which you can toggle on and off using a switch in the View tab—just changes your Inbox to show “Focused” and “Other” tabs.